Hello. It's me, the author of this blog. You may remember me from a previous time when I posted regularly on Thursdays. At least it was on Thursdays, then it started slipping to Fridays, then Sundays, and then just skipped weeks altogether. Funny thing about procrastination, it gets worse over time because you just keep putting off addressing it. But I'm back now, with great intentions of being more reliable. I've finished my therapeutic riding program and am now unofficially/officially a registered riding instructor. If only I had some students, some horses, and an arena. Minor details. In the meantime, I thought I'd drive back across the country. But this time, not only will I have Keeper the Dog, but I've acquired an Israeli to drive with me. A one-armed girl, a dog, and a Jew went on a road trip...sounds like a bad joke, right? And I'm well aware that it is not politically correct to call someone a 'Jew,' but Nomi has a great sense of humor, so I think she'll forgive me. We started off our grand adventure in New York City, where else? 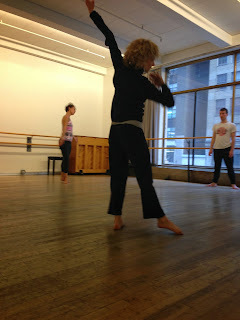 First we caught a Heidi Latsky dance rehearsal on the Upper West Side. They were re-working a piece they had previously performed, and mid-rehearsal, over break, Heidi bemoaned the lack of disabled dancers in the company. They discussed how they might recruit a deaf man who was the friend of another dancer. "He's not really deaf," one dancer piped up, "he's just hearing-impaired." There was a collective sigh, at which point I giggled and everyone turned to look at me. In what universe had I dropped into where people are valued based on the severity of their disability? After rehearsal, we took the obligatory trek over to Times Square. Both of us being more country-lovers than city slickers, we left 42nd Street as quickly as possible and took refuge in the relatively quiet Little Italy. There we were joined by two Jewish guys in a meeting arranged seas away in Israel. Sounds like the plot for a comedy, right? One of them had such a strong Brooklyn accent, I was sure he dropped right out of Newsies. They had us eat cannoli in an abandoned park and play fuze ball at a local joint. Felt like a local...at least, I think. But now, and for the next week or so, we are tucked away in Central Pennsylvania, where I'm mooching lodging (and food) off my parents. And catching up on some blogging, of course. So, there you have it. Didn't miss a thing.